"Yesterday, I thought I was in love with this little quilt. 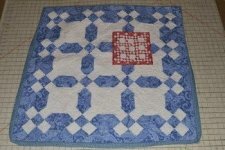 Now that I've got it quilted, it's a case of full blown quilt lust. "In case you didn't read the last post, this is a scaled down version of Marilyn with the color placement in the nine-patch blocks reversed. The blocks are 1 1/2" and the quilt itself finishes at about 7" square. I could have, by the absolute skin of my teeth, used the same fat quarter for the top and back and binding, but I decided to use a piece from a coordinating pink fat quarter. The more different pinks in my stash the better, right?" 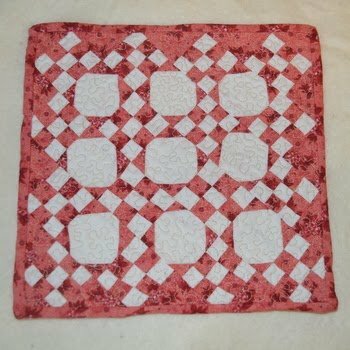 Get the original Marilyn baby quilt tutorial here.